Imagine being treated for cancer or another life limiting illness in a hospital yet being given no or inadequate relief for pain.A recent article published on ehospice/Kenya highlights the need for training of medical staff in how to assess pain and provide pain relief. When going to hospital to be treated for whichever ailment that has decided to attack your body, one would expected to be “pain free” as they undergo the necessary procedures to cure them. Well some do get pain free help but the majority of others still suffer under severe pain, not because the hospital does not have the adequate medication needed to free your body from torture, but at times it’s because the clinicians are not empowered to asses and manage pain adequately. Due to this gap in the medical world an initiative dubbed “The Pain Free Hospital Initiative” (PFHI) which is supported by Treat the Pain-a program of the American Cancer Society (ACS) in partnership with Kenya Hospice and Palliative Care Association (KEHPCA) was developed to integrate pain treatment into service delivery at hospitals where pain relief medications are available yet under-prescribed. The goal of the initiative is to equip staff to assess pain, provide high-quality first-line treatment, and in doing so improve overall access to essential pain medication eventually leading to improved quality of life. To effectively implement pain management into a health care system, it requires access to medicines and an understanding of when and how to give pain medication and the prioritization of pain management as an essential part of care. 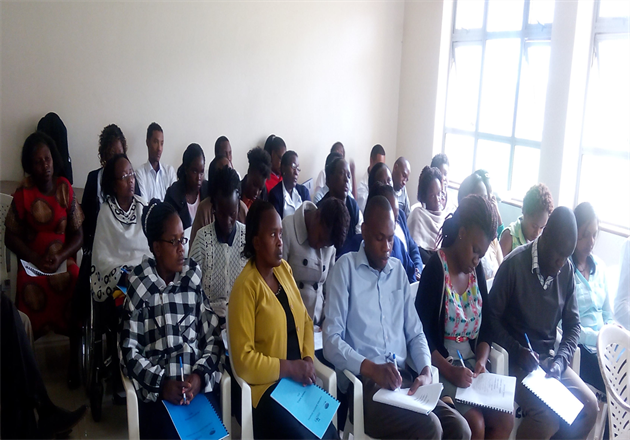 The latest training was held at Machakos Hospital where Hospice Care Kenya provides support to the Palliative Care Unit. The session focused mostly on opioid initiation, titration and dispelling the myths concerning opioids e.g. addiction. Each topic they covered was clearly evidence based making it a subject that was close to home. Mr. Musau, the head of the palliative care unit at Machakos Hospital pointed out that people are very eager to learn and practice in reality, and have seen that pain is a very important aspect to tackle. The hospital has plans underway to have all the clinical service providers undergo the PFHI training and sensitize the non-clinical staff on pain management.